It would be easy to categorize Imaro as a novel in the tradition of Conan, only written with a black African hero. It would be easy, but only partially correct. The truth is that Imaro is a fully realized sword and sorcery novel set in an alternate Africa, one which respects the traditions and histories of Africa in general and Rwanda specifically, one which attempts to draw the Western reader into a world they have seldom encountered and never like this. Originally published in 1981 Imaro tells a classic pulp sword & sorcery fantasy of a young warrior who was a half-breed and never truly accepted by his mother’s tribe. Betrayal and dark magic force Imaro to leave his homeland and seek a life elsewhere. Imaro’s physical prowess gains him renown and while Charles Saunders has written this hero in the tradition of Conan, Saunders has built upon Howard’s foundation and built a distinct hero in a mould of his own. In the “Revisiting Imaro” essay at the front of the 2006 Night Shade Books edition, Charles Saunders writes of his decision to revisit and revise the text of Imaro. He wrote about his 1970’s story “Slaves of the Giant-Kings” and how it was adapted into Imaro. In that original story there was a slaughter (though not a systematic genocide) of one tribe modeled after the Tutsi by a tribe modeled after the Hutu. Then came 1994 and the real life Rwandan genocide occurred. Tutsi slaughtered by Hutu. At the time of the Rwanda genocide the three published Imaro novels were out of print. I had entertained sporadic thoughts of reviving them, but those considerations ended as the impact of the events of Rwanda hit home. My fiction had inadvertently crossed the border into reality, and there was no way I could allow “Slaves of the Giant-Kings” to go into print again. To do so would have given the impression that I was trying to exploit the Rwanda genocide, even though the story was first written nearly twenty years before the event. Saunders goes on to explain much of the process of how and why Imaro was revised for the 2006 edition, but it is important to note that this edition is, in the end, substantially different from the original 1981 edition. The consequences of this change, of replacing “Slaves of the Giant-Kings” with “The Afua” ripples through the rest of the novel and into the rest of the series. The end result is that no matter what the original Imaro was, readers of the 2006 edition can rest assured that the book they hold in their hands was as carefully thought out and purposefully written as the original. That every word matters and that the impact of changes was considered. The end result is that Imaro is still a damn fine story which demands to be read. Imaro the character and Imaro the novel are created as part of a warrior tradition. Readers can expect to encounter intense battles and feats of great strength and cunning. Readers can expect to be taken on a thrilling adventure in an unfamiliar yet very real world. This is a dark and violent tale and is a powerful vision of a proud warrior. Fans of Sword & Sorcery or Epic Fantasy should love this. Charles Saunders will draw readers in and keep them hooked with the strength of his storytelling. This is good stuff, and I would go so far as to say that Imaro is an important novel, and as such, not to be missed, though the relatively poor sales of Saunders would suggest that a lot of people have missed out on Imaro and the two sequels. That's a shame. 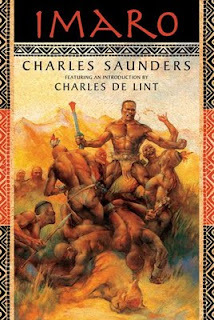 Besides blazing a trail with a novel centering on a truly African hero in a truly African setting (something not seen near enough in fantasy), Charles Saunders has also just written an excellent novel. Period. I agree that Imaro is an important novel. My only regret is I didn't discover the series until it was re-released by Nightshade in 2005. Since then I've read Imaro Two under Nightsade and Imaro Three published by Sword and Soul Media. These are great books by a great writer. I'm looking forward to the completion of the series. I plan to pick up Imaro Two sometime in the next few months and then, unless some miracle happens at Night Shade picks up Imaro Three (unlikely), I'll buy that direct from Saunders.